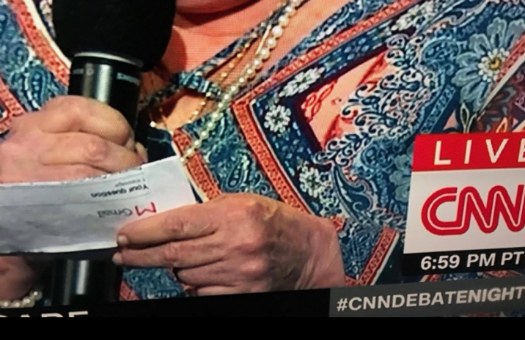 An accusation has been made that CNN fed a question to a member of the audience for Tuesday's debate on Obamacare between Sen. Ted Cruz (R., Texas) and Sen. Bernie Sanders (I., Vt.). The Gateway Pundit has still images of Carol Hardaway asking her question to Cruz with a piece of paper in hand with what appears to be a Google email exchange with the subject line as, "Your question." Cameras captured Caraway holding the paper with her left hand as she holds her microphone close by with her right hand. Hardaway said that she moved from Cruz's home state of Texas to Maryland to be covered by Medicaid to treat her Multiple Sclerosis. She then asked if he would make sure a replacement plan was in place before Obamacare is repealed by Congress. This entry was posted in Politics and tagged CNN, Debate, Ted Cruz. Bookmark the permalink.